Andrew waited in the church in his dark gray tux and bow tie, ready to marry the love of his life. He may not have been prepared for just how beautiful she looked when she was escorted down the aisle. Kristine looked like a goddess. Her hair was partially pinned back, with cascading curls that fell over her shoulders and back. 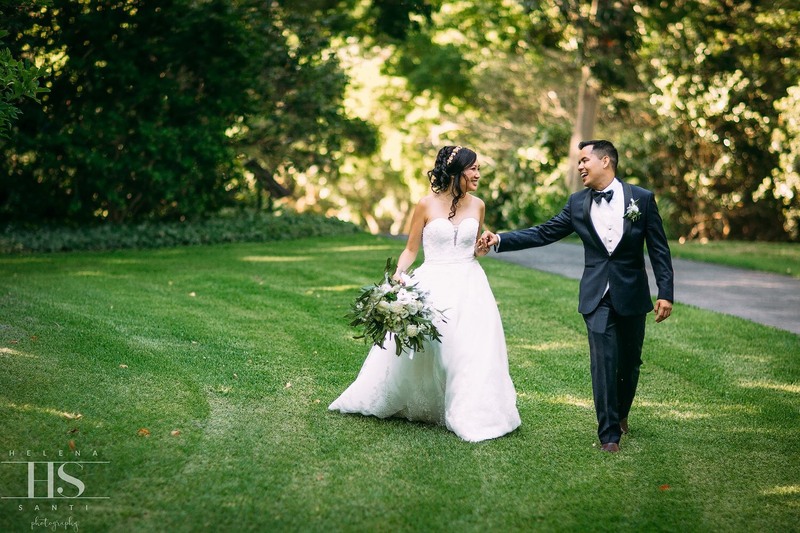 The elegant bouquet complimented Kristine’s beautiful A-line wedding dress and gorgeous long vail, both an ivory vision of lacework and whimsy. Kristine and Andrew’s relationship has been a picture book of love. 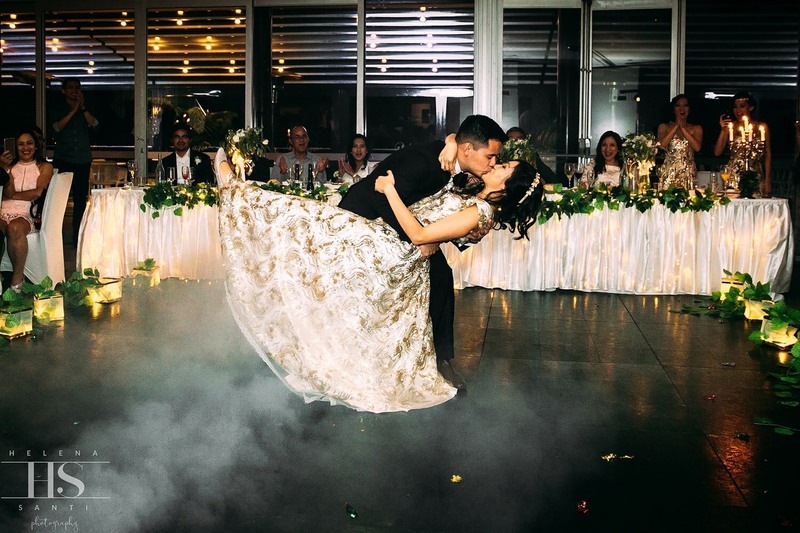 They first met in university, introduced to one another by a friend during a school event, and what followed was a relationship that only grew stronger over time. Kristine became a registered nurse and Andrew became a systems analyst, two very different but supportive roles that mirror their relationship. 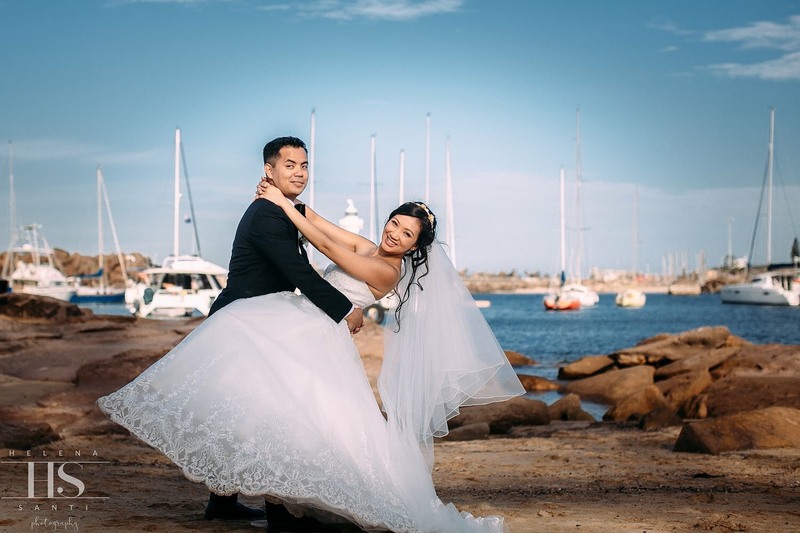 One evening, Andrew took Kristine to Milson’s Point in Sydney. In the car, he asked her to hold a small box before leading her out to the Opera House, where he proposed as they stood across from the Sydney Harbour Bridge. It was a beautiful moment in the city’s most iconic and picturesque locations. The Lagoon reception started on the deck, where guests arrived to enjoy drinks and canapes including Oriental Spring Rolls, Tomato & Basil Bruschetta, and Potato & Kumara Frittata. It was a breezy summer’s day, allowing for a perfect view of the waterfront. After enjoying food and drinks, guests were seated inside and treated to Woodfired Sourdough and Garlic Bread. 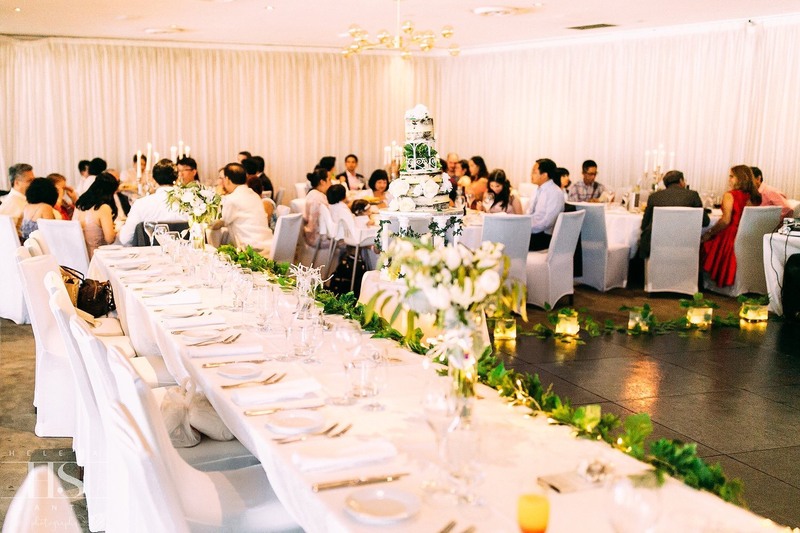 Each table featured a lit silver vintage candelabra, and the chairs were overlaid with simple but elegant white covers. The MC introduced Andrew and Kristine as a married couple for the first time, followed by a fun dance number by the wedding party. 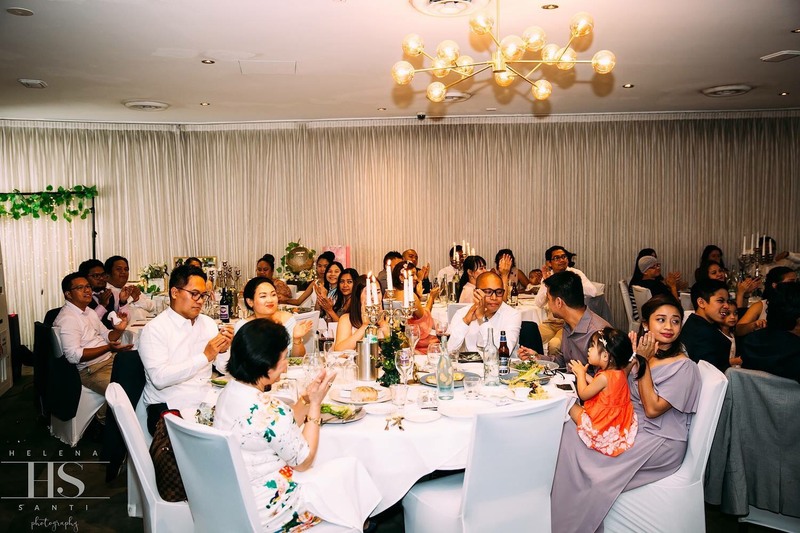 Chicken Cardini and Smoked Tasmanian Salmon were served as entrées, and guests raised their glasses in toast to the happy couple. More speeches were made as the main course was served, which featured Berkshire Pork Belly Three Ways and the Veal Prime Rib, complete with Garden and Greek salads. Andrew and Kristine cut the cake together – a naked three-tier cake adorned with flowers that matched the bride’s bouquet. 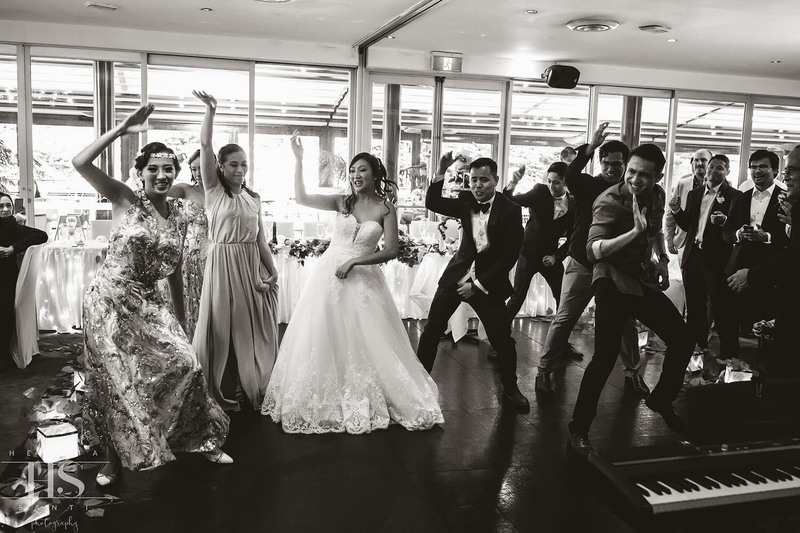 Coffee was served with the desserts — Vanilla Bean Panna Cotta and Creme Brulee, as Kristine and Andrew danced together in a bridal waltz. After the reception, the two were spirited away to a honeymoon at the beautiful Coron, Palawan in the Philippines. Kristine and Andrew said their wedding was a beautiful moment in their lives that they will never forget.